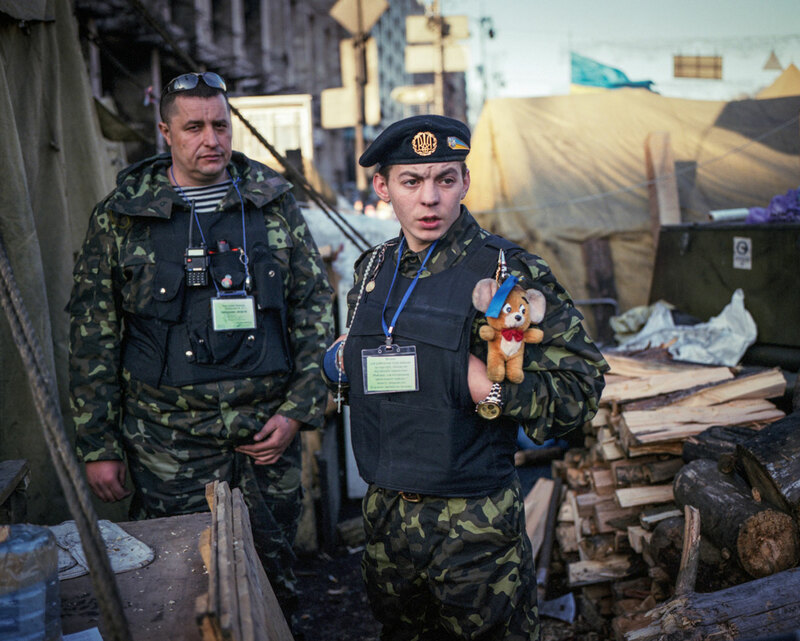 Petro is a volunteer of the Maidan self defense unit and guards the entrance to his Sotnia (Unit) tent in Kiev’s center. He has been there since December and came from a small town in western Ukraine. He will stay there until the new legitimate government will be elected on May 25. 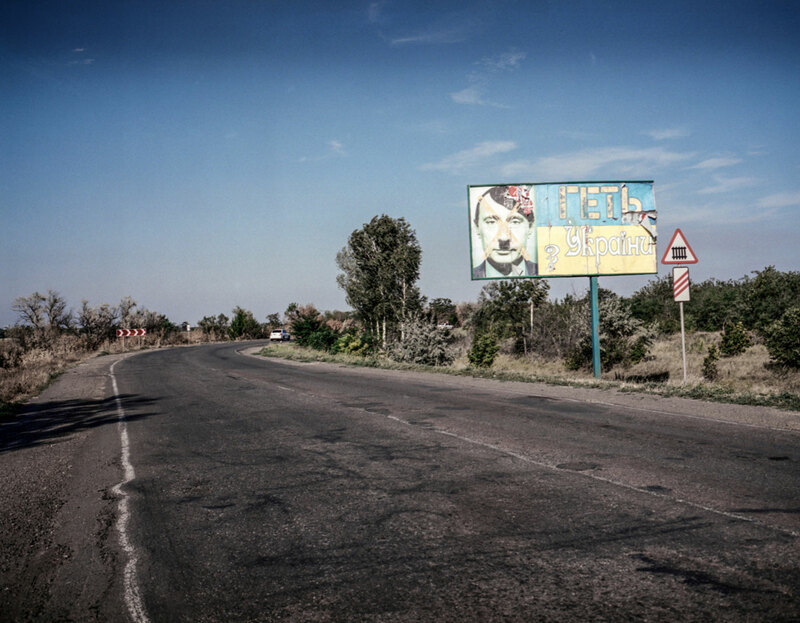 Billboard with a picture of Putin as Hitler and the words “Get out of Ukraine,” on the road from Mykolaiv to Kherson. Deniz and Lena stand with a pro-­‐separatist “civil self-­‐defense” group of local people. They were unarmed and kept vigil by the administrative building in Yenakiieve, the birthplace of ousted president Viktor Yanukovych. We started talking about politics but the topic quickly switched to economic grievances, rising prices and the lack of perspectives in a city where male miners make up to 3.000 HR ( about $260) a month whereas women make as little as 1.500 HR ($130). The people complained that they work here for the prosperity of the rest of Ukraine (which is a popular sentiment in the Donetsk Region) and the factory does not even install filters, forcing them to breath polluted air. They complained that official documents are in Ukrainian, that the crime situation is out of control and that gangsters interfere in politics. 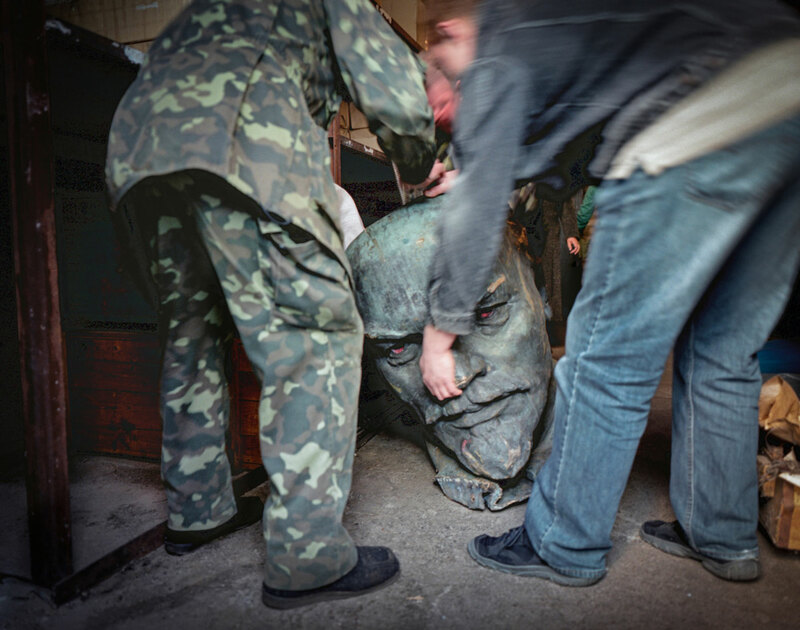 Museum workers move Lenin’s head. 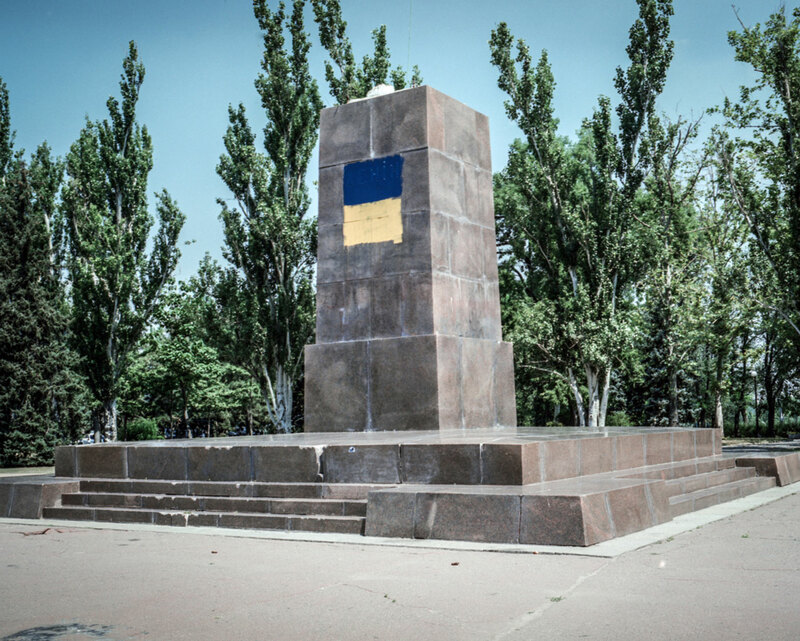 It was removed from the Dniepropetrovsk Main Square, along with the sculpture of Lenin, by protesters. The director of the local historical museum will keep it in the warehouse. 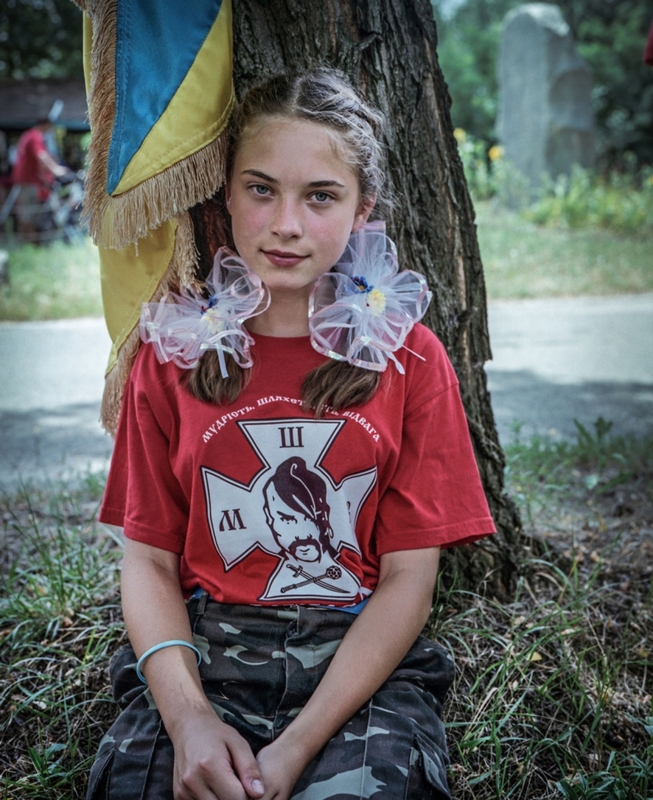 She collects items from the Maidan Revolution in the hopes of having a future exhibition. Since protests started in December 2013, around 20 statues of Lenin were removed from cities across west and central Ukraine. 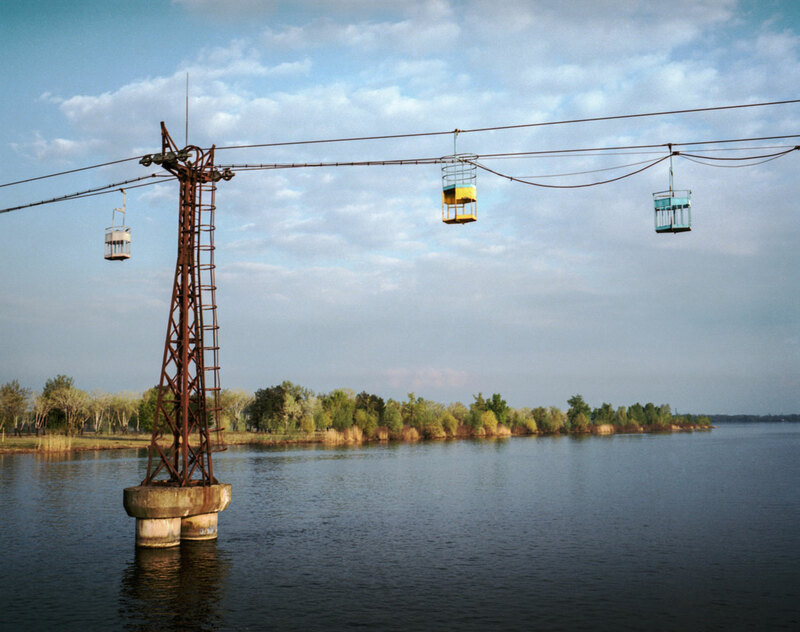 Soviet-­era cable car operates over the Dnieper River in Dniepropetrovsk. 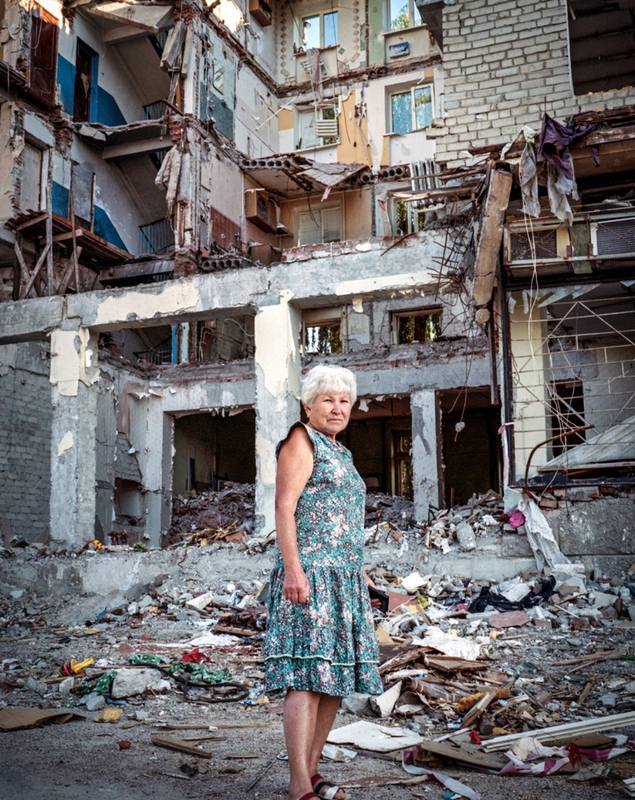 Some people call Dniepropetrovsk the "war capitol of Ukraine." Dnepropetrovsk is in central Ukraine and is the fourth largest city (1.1 million inhabitants) and the main industrial center of the country. During the Soviet regime, it was one of the Soviet “closed cities” because of its nuclear and space industries and weapons manufacturing . Pro-­Russia separatists failed to take control of some administrative buildings. Ihor Kolomoyskyi , oligarch and current Governor of Dnipropetrovsk announced a $10,000 reward for exposing pro-­Russian separatists. Masha (nom de guerre, “Myshka”) used to be a hairdresser in Luzhansk. 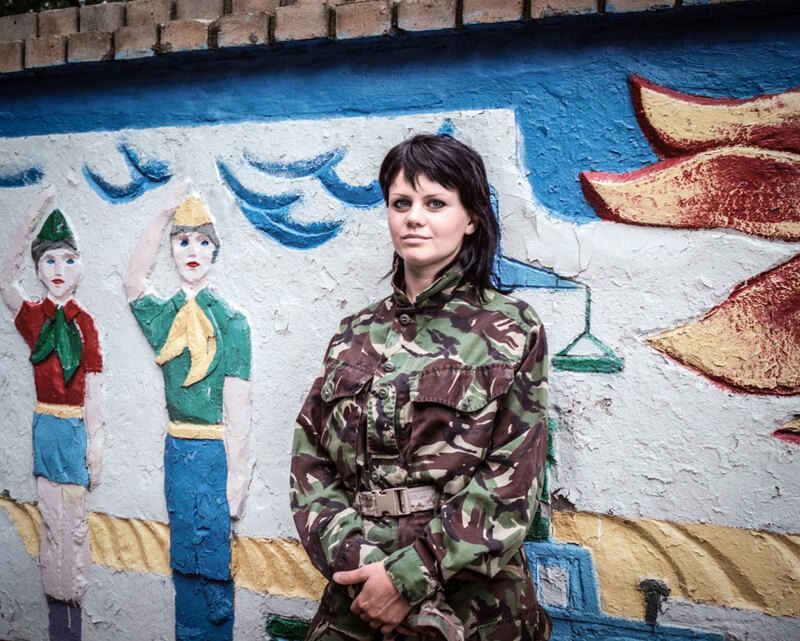 She joined Donbas Battalion in April. Dniepropetrovsk Region, July 2014 . “My friends called and told me they are joining the Donbas Battalion. They asked me what I thought of that. I immediately agreed to go with them, we went the next day. I talked about it with my parents and other family members; they reacted normally and supported my choice. Now they are abroad and I am here and will stay to the end. 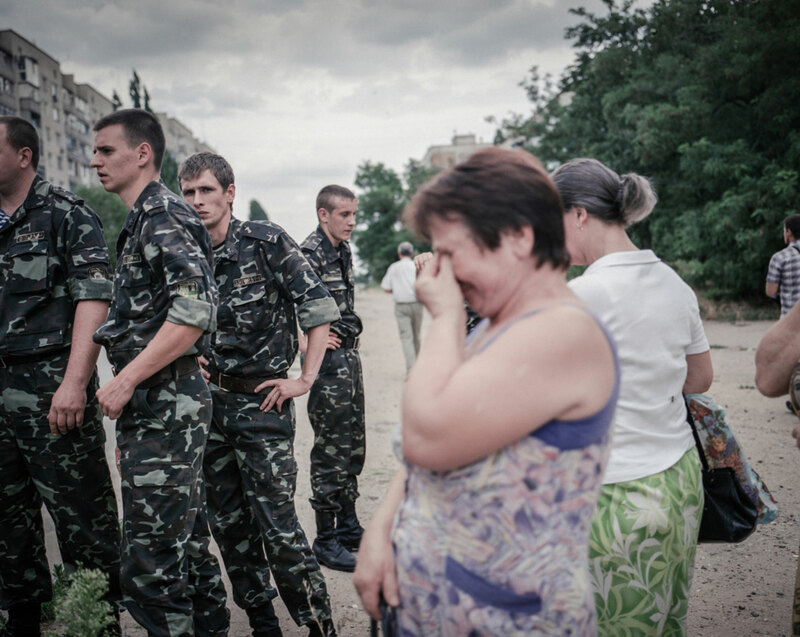 Funeral of a Ukrainian soldier in Mykolaiv, July 2014. Aleksander Kostiushko (40) was among the dozen soldiers from the 79th Paratroopers Brigade who died on the border with Russia after Ukrainians were allegedly attacked from both sides; by rebels and from Russian territory. The brigade is comprised of some professional soldiers but most were either drafted from the reserves or came as a volunteers. Aleksander came on his own free will in spite of his mother’s begging him not to go (his friend said she pleaded on her knees). The Ukrainian army is a mixture of conscripts, a relatively small amount of professional soldiers and a considerable number of volunteer battalions which were formed after the war started. On Sept. 5, 2014, the Ukrainian government signed a ceasefire with the rebels and Russia. Some 3,000 people are dead, although unofficial numbers are much higher. Hundreds are missing. About 260,000 people were displaced as of Sept. 1, although the United Nations believes this is a very conservative estimate. 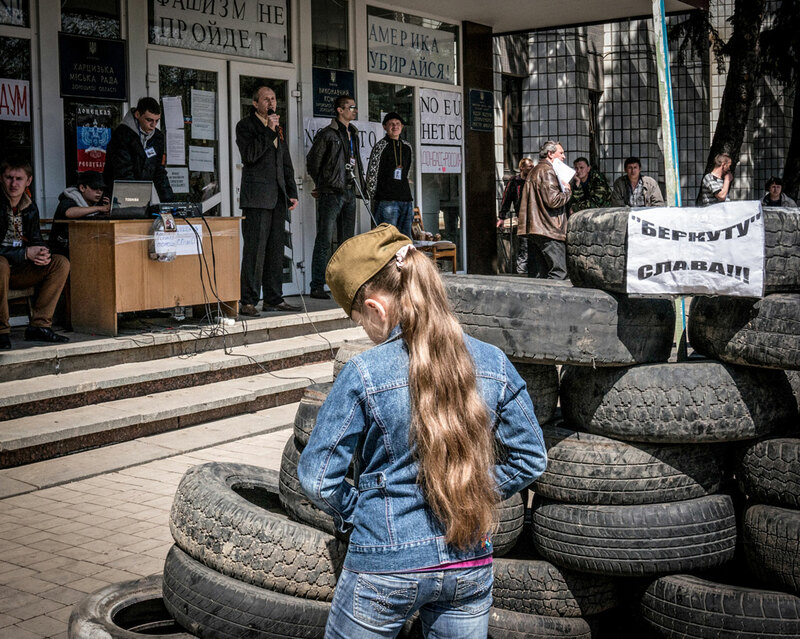 Girl in a pro-­Russian rally in Kharcysk on Donetsk Outskirts. I met Shura by the Dutch Embassy in Kiev the day after Malaysian Flight MH17 was shot down over Donbas. She introduced herself as a Ukrainian patriot and is of mixed Ukrainian, Russian and Tatar origins. She and her parents are living in Kiev as Internally Displaced Persons (IDPs). She helps other IDP's and collects aid for the Army. “I was a Maidan activist. After we won, my friend and I decided to help and take children’s letters to the Ukrainian soldiers surrounded on their bases in Crimea (during the Russian invasion). I also wanted to see my parents. But we were stopped at the Armyansk Check Point (Northern Crimea). Berkut were there, and Cossacks and local self-­‐defense forces. They beat us, threatened to shoot us. They saw my tattoo and said they would cut my arm off -­‐ because the Berkut who beat us was at Maidan against us. After that, we were loaded in an Ural army truck and taken to Sevastopol to the Russian army base. We were there for two days. The FSB was interrogating us, but luckily we were set free because friends and other people got involved in our release. But they were threatening me, saying they were going to take me to Russia, to the Khabarovsk army prison for women. 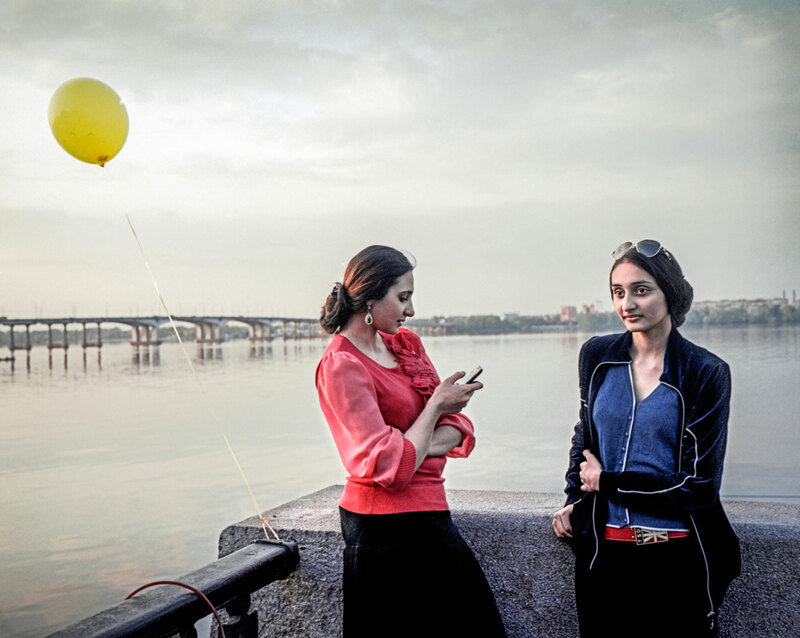 Two gypsy sisters Ruslana ( 16 ) and Milana (19 ) taking the evening stroll along the Dnieper River. When asked if they study they laughed and said that they finished their education already. I just came from Donetsk and Slavyansk, and Dniepropetrovsk with people strolling along the river seems like it is in a different , safer country without checkpoints and armed people. A few days earlier, a gypsy family was attacked by armed and masked man in Slavyansk , a separatist stronghold. Here in Dniepropetrovsk, in central Ukraine, the girls said they are fine, nobody bothers them. Patriotic youth exercise in Dneipropetrovsk. 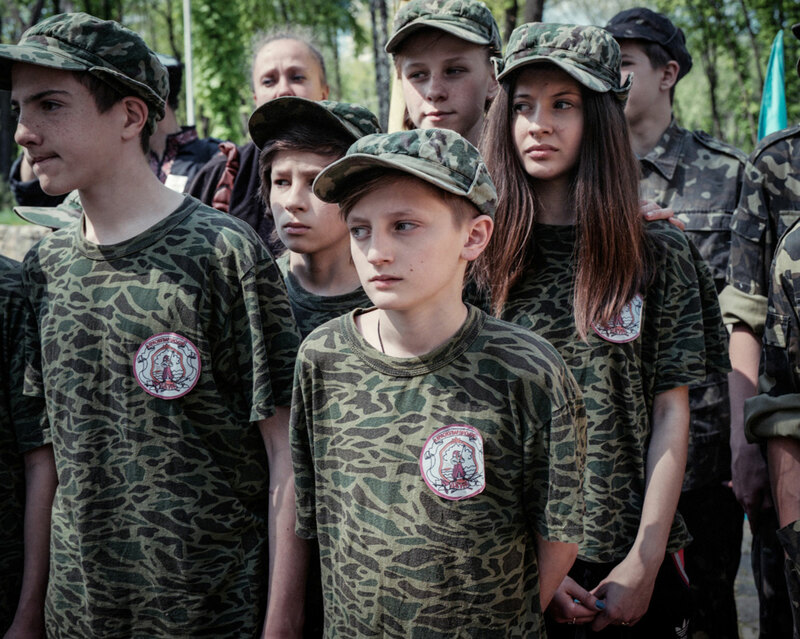 School kids took part in a survival skills competition, organized by local pro‐Ukrainian Cossacks. Many of these Cossacks took an active part in the Maidan protests. Now, they help police guard administrative offices agains possible attacks by pro-­‐Russian separatists. The first person shot and killed during the Kiev protest was a man from the Dniepropetrovsk region. 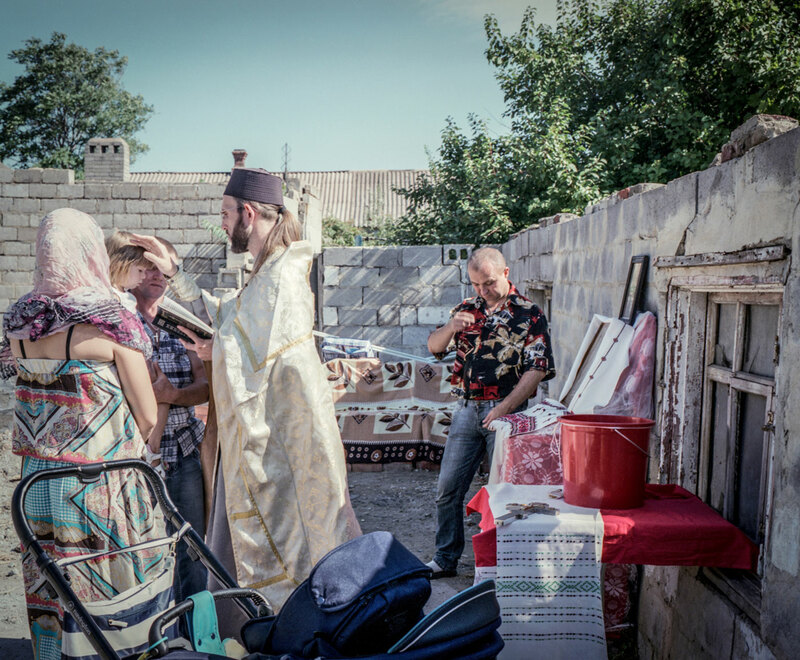 Donetsk residents are blessed by a priest on Easter Sunday. In Ukraine, there are two orthodox churches -­‐ the Ukrainian Orthodox Church of the Kyiv Patriarchate and the Ukrainian Orthodox Church of the Moscow Patriarchate. In Crimea and in eastern Ukraine, they often compete. The day after Easter Sunday, a rebel check point in Slavyansk was attacked over night, allegedly by pro-­‐ Ukrainian forces. A few local men died, which escalated the conflict to a new level. 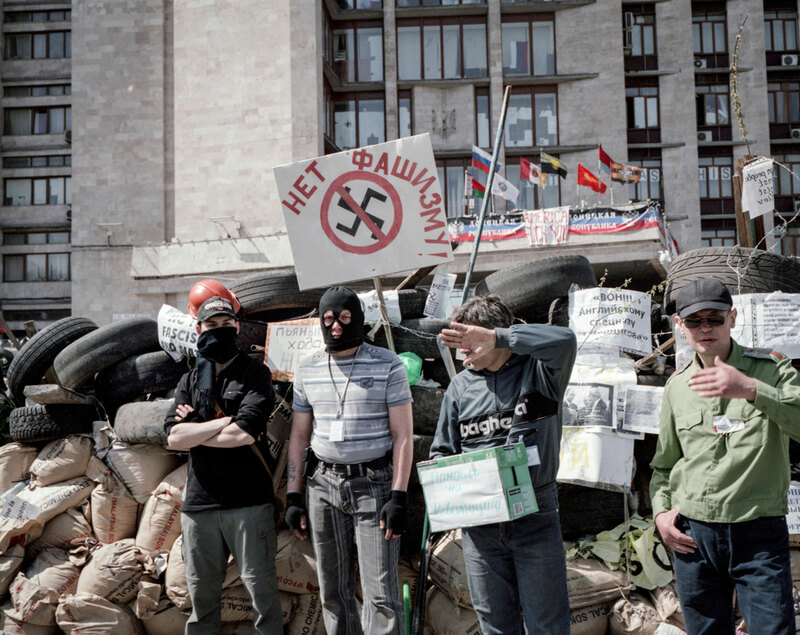 Pro­‐Russian protesters, who seized some administrative buildings and declared the People's Republic of Donetsk on April 7, 2014, stand in front of the occupied Regional Administration Building. Gyorgg Lakatos with his son Sebastain on a beach in Cherkasy by the Kremenchuk Reservoir on the Dnieper River, July 2014. Lakatos is a technician in a circus in Italy. His Ukrainian ex-­‐wife works there also, as a bartender. 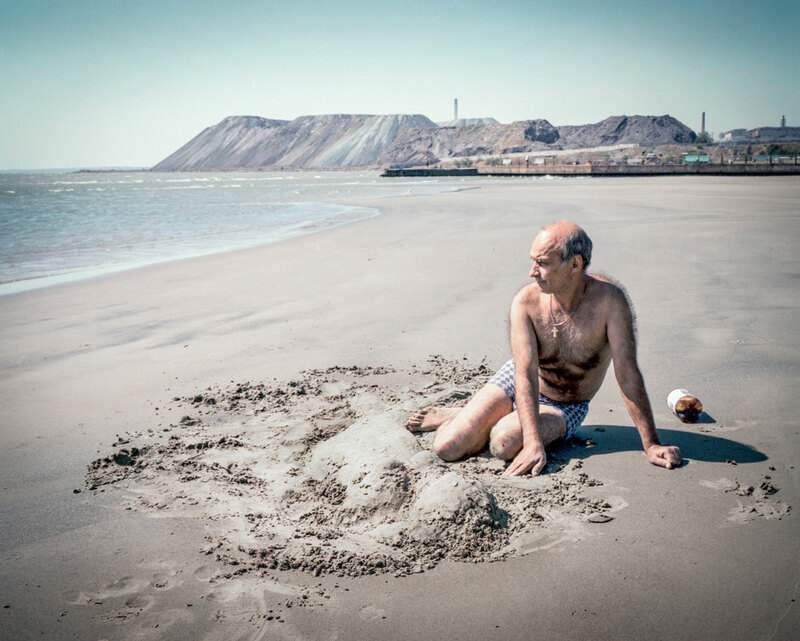 He comes to visit his son in Cherkasy, where he lives with his grandmother while both parents work in Italy. “I like Ukraine but there is no work here, and that is bad,” he said. 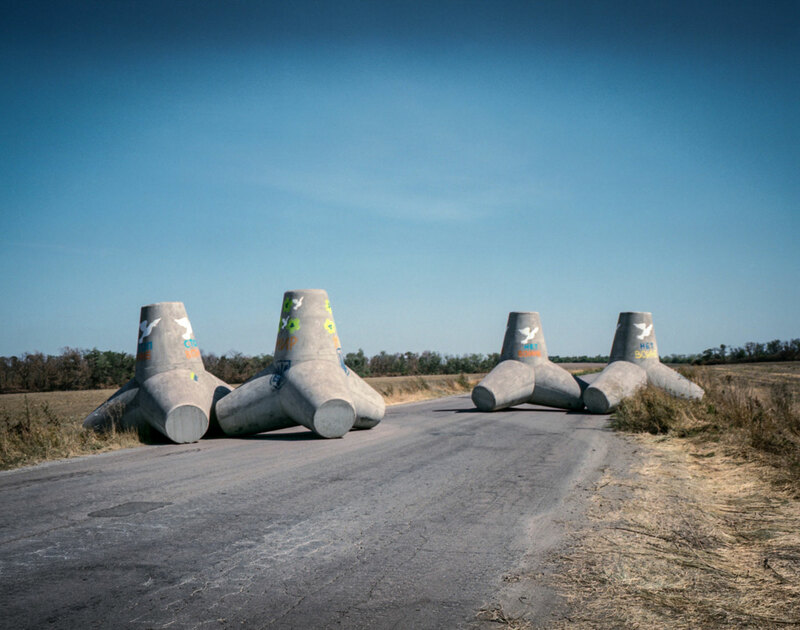 Cement wave breakers block the road from Novoazovsk, in expectation of a separatist push any day. Before the war the road was packed with cars traveling between Russia and Ukraine. At the end of August separatists backed by Russia took control over the port of Novoazovsk, opening up a new front in the war. 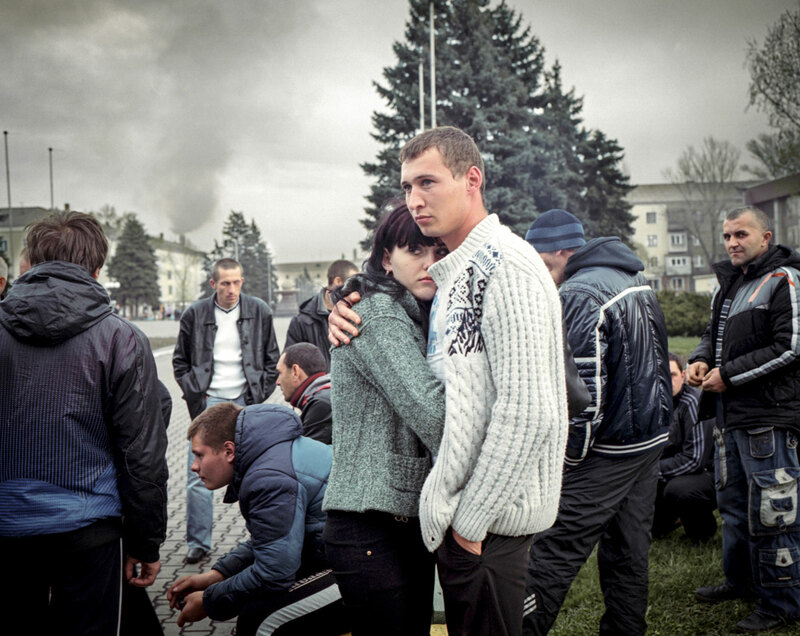 On Sept. 5, 2014, a ceasefire took hold in Ukraine, suspending fighting that had raged for nearly five months . UKRAINE, Dniepropetrovsk Region, July 2014. 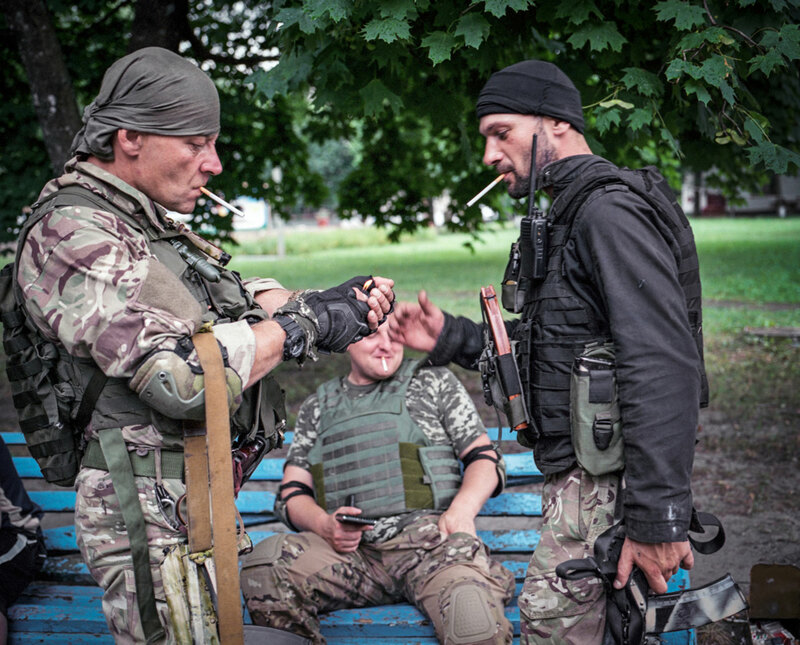 Three soldiers from the Donbas Battalion prepare for a reconnaissance trip. Left: Nom de guerre, “Roni,” from Kiev. Soviet Army experience, doctor, construction worker, self-­‐ employed. He joined Donbas because at 49, he was too old to join the regular army (the age limit is 45). “I have a 6 year-­‐old son and if he were to ask me in the future what I was doing during the war I wouldn’t want to tell him I was in the “Couch Battalion,” he said ironically. The Couch Battalion are people who fight the war at home in Kiev from behind their computer on Facebook, he explained. Middle: Nom de guerre “Dan,” a video operator from Odessa. His family came to Ukraine in 1989 when many Ethnic Russians left Kazakhstan. Right: Nom de guerre, “Stuff,” from Lviv. A Russian citizen from a mixed Ukrainian-­‐Russian family, he grew up in Ukraine, later lived in Russia and retuned to Ukraine. For three years, he had problems getting Ukrainian citizenship, which prevented him from getting work and settling down. On January 5th, he came to Maidan to join the protest. The Battalion Donbas has helped him get Ukrainian citizenship. He has a young daughter in Lviv. Yaroslava (5 ) is an IDP from Donetsk. 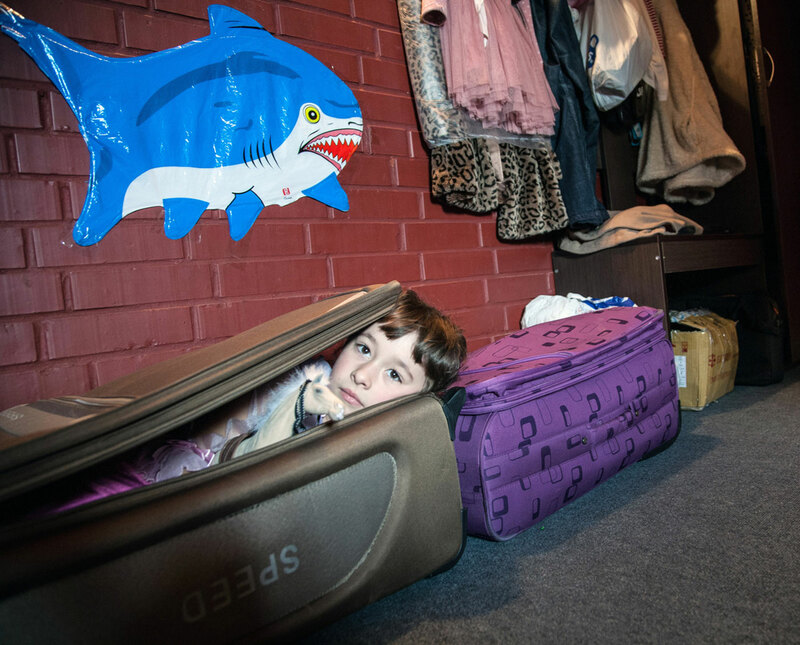 She often plays in a suitcase her mother and grandmother brought with them while leaving Donetsk. Stanislav, Yaroslava’s father, divorced her mother but to help his daughter he set them up in a private hotel The owner of the hotel, on the outskirts of Lvov, helps IDPs free of charge. Stanislav was a Maidan activist in Donetsk and fled the city in February . His ex-­‐ wife, mother and daughter fled first from Donetsk to Mariupol in July . When the war came near that city in September, they went to Lvov, where Stansilav was already leaving. 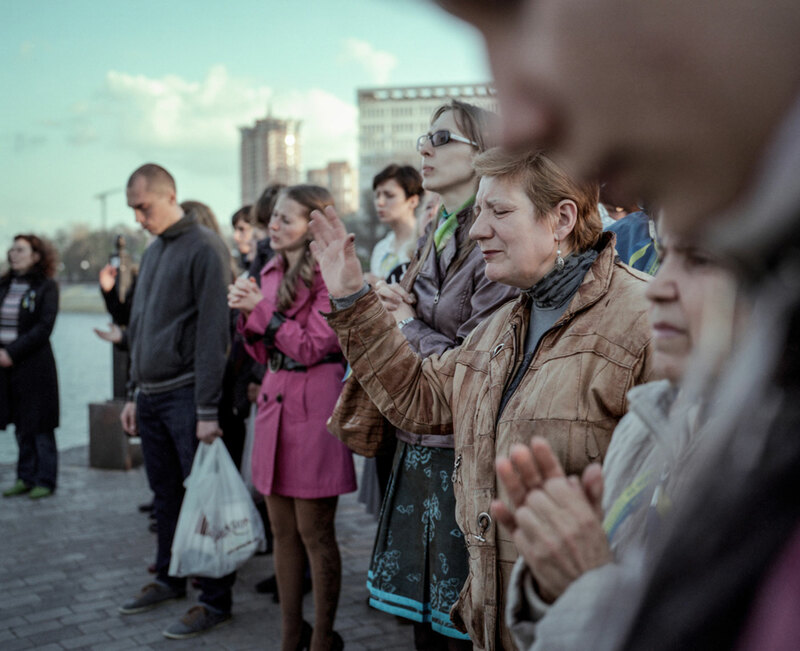 Each day a group of about 70 people prayed by Constitution Square for the unity of Ukraine and for peace. The service was jointly conducted by priests of various faiths in Donetsk: Orthodox, Evangelical, Gospel Church and Catholic among them. In June, they were forcibly dispersed by armed rebels. When one priest tried to protest he was beaten, another was kidnapped a few days later. Both were released after brutal interrogations. When rebels took control of the city they declared that the dominant religion is the Russian Orthodox Church of the Moscow Patriarchate. Alla Vashenko (long hair, 25, unemployed) and Alla Galasiuk (27, on maternity leave). The women met on the Internet, looking to breed their dogs. Galasiuk said this year she will not go to Crimea to vacation, but to Odessa instead, as a protest against the Crimean occupation. Vashenko said she does not follow politics so that she can stay calm. She has a Russian boyfriend, who she says is ashamed of what his country did in Ukraine. Right Sector training camp in Carpathian Mountains. For training they use mainly wooden guns. Right Sector is not registered with any official structure of Ukrainain government yet Right Sector Fighters served on the front line as volunteers. Father Vladimir, of the Ukrainian Orthodox Church of Kyiv Patriarchate, baptizes the first child ever in his Church, which is just about to begin construction. 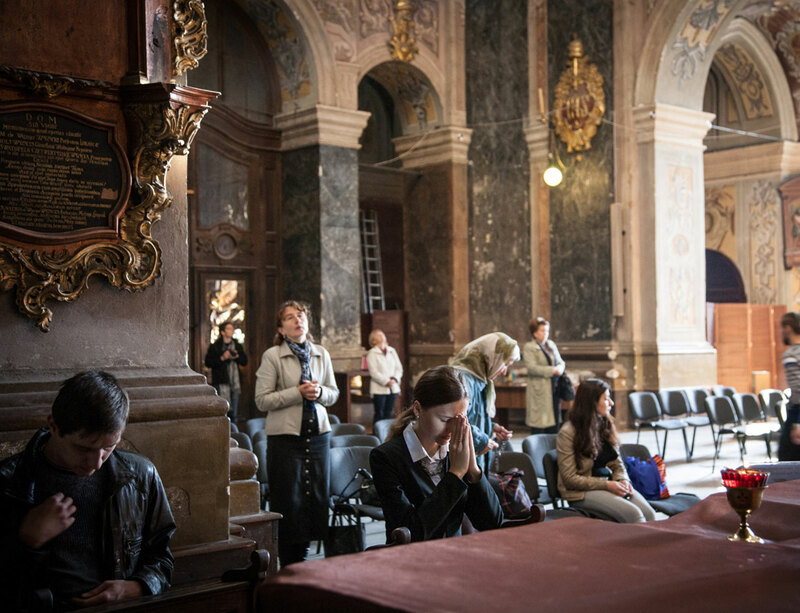 “We [ the Ukrainian Orthodox Church of Kyiv Patriarchate] came with the fall of the USRR. With independent country there should be an independent church,” he said. Our teaching is in line with canon laws and with apostolic teachings of the firsts Christians. . . We have services in Ukrainian language while Ukrainian Orthodox Church of Moscow Patriarchate uses Old Church Slavonic. “The River Dnieper is probably the same for us, as the Thames is for the English. It’s a symbol which is holy for anyone who considers himself Ukrainian. It is a national symbol. How many heroes died in its waters. It is holy water. It is a holy river for me. Olga Antonovna Onoprenko (68) and husband Grigorij Yegorovich(72), a retired couple from Cherkasy. Ukrainian flag painted on the column that once supported a sculpture of Vladimir Lenin, which was taken down by pro-­Maidan activists. In April 2014, pro-­Maidan activists chased away a small group of pro-‐Russian protesters and set up checkpoints on the city outskirts, which checked suspicious cars entering Mykolaiv. Tatarikova Irina (22 ) prays for the safety of her husband who is about to go back to the front as a professional soldier. She came here to pray every day when he was on the front line for the half of the year. He returned in September just in time for their wedding three days later. 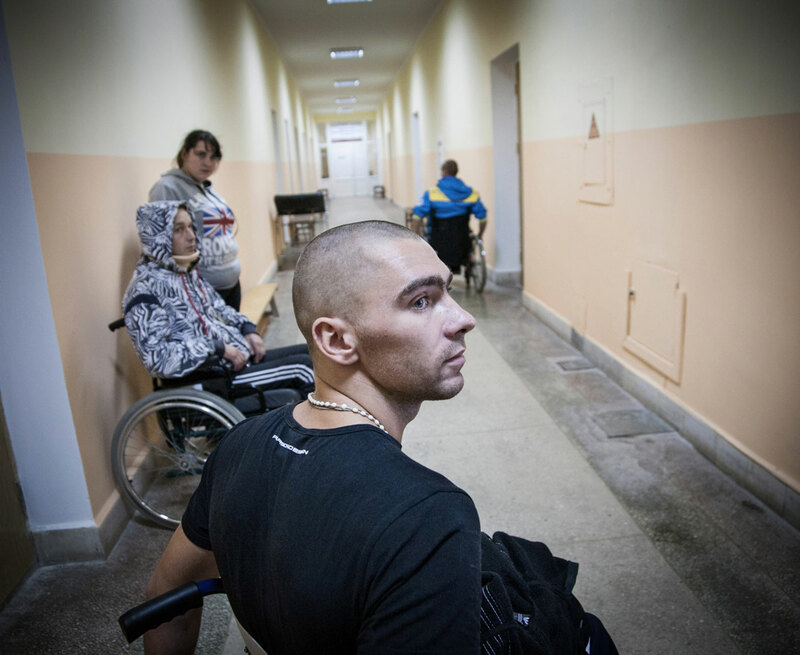 Petro Bavdro (23) is undergoing rehabilitation in the Lvov Army Hospital. 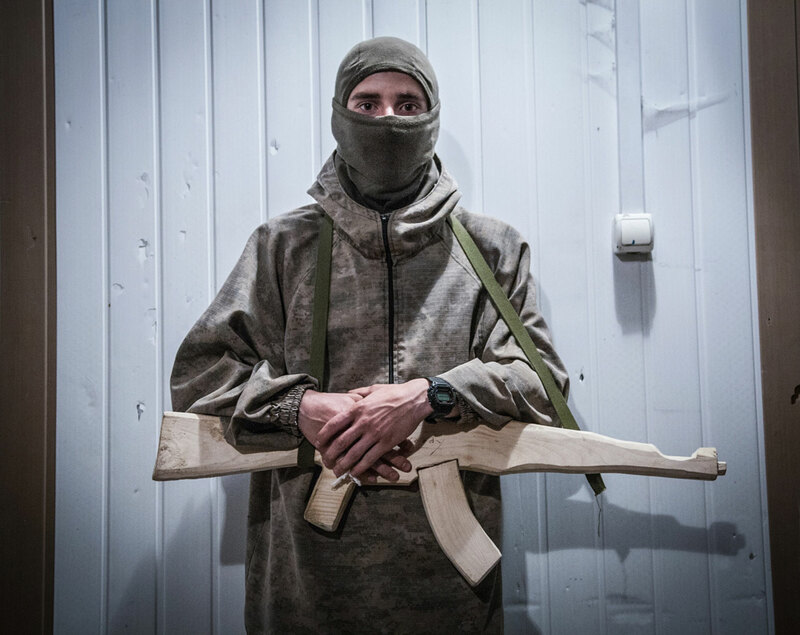 Petro is a professional soldier from Malehiv village, 7 km from Lvov. He was contract soldier, a sergeant in the second year of his five- year contract when he was wounded on August 16 during a shelling at Luzhansk Airport. He was the only one to survive in his group. His 10 colleagues died in the shelling. Their bodies covered him He has a spinal injury and undergoes rehabilitation so he can walk again. Ira Vietka (13) in Zaporizhia, Khortytsia Island, July 2014. Kids from the “Club of Youth Peacekeepers “ (working under supervision of the UN), from Kamianets-­‐ Podilskyi in west Ukraine, came to Kiev to attend a youth camp. The camp is located on the Khortica Island Cultural Reserve and is one of the largest islands on the Dnieper river. It is the heartland of the Zaporozhian Cossacks (who have a museum dedicated to them). 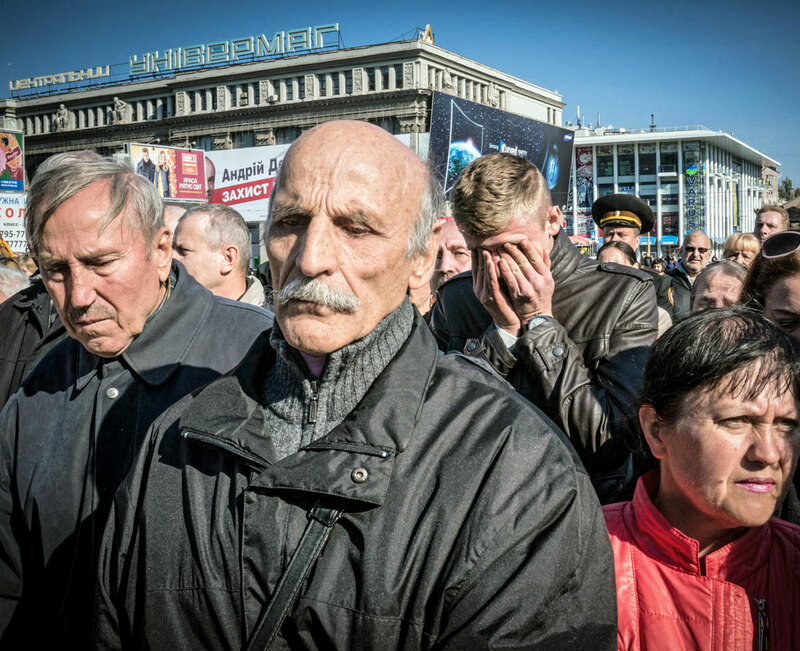 Dniepropetrovsk residents pay respect at a service for the fallen Unnamed Soldiers held in the city center. This was a mass funeral for 21 unidentified Ukrainian solders, who were killed in the area of an anti-terrorist operation. Before the burial experts collected DNA samples for further identification. Around 400 empty graves were prepared for unknown soldiers at the Krasnopilske cemetery. Nina Antonovna stands in front of her house. It was destroyed on July 3, 2014, at 8:15 in the morning during the battle for Slavyansk. Half of her flat is gone. She lost her daughter, who had came from Krematorsk. Nina thought her daughter would be safer with her, because the house was next to a large communal heating plant, but it ended up being a target. Up to 25 people died in the house and many survivors have no place to live. Leonid Bibik (24) dressed as a ousted president Victor Yanukovich, poses for photographs with people visiting Mezhygorie, the private residence of the former president, which was taken over by protesters. Leonid was a Maidan activist and part of Self Defense Unit (1 Sotnia). He was wounded on February 18 when he drove a van into the Berkut (Police Unit) and was shot at. Now he works in Mezhygorie and the money he earns posing for photos goes towards maintenace of the place. My story explores the division of Ukraine, using the Dnieper river as my guide. 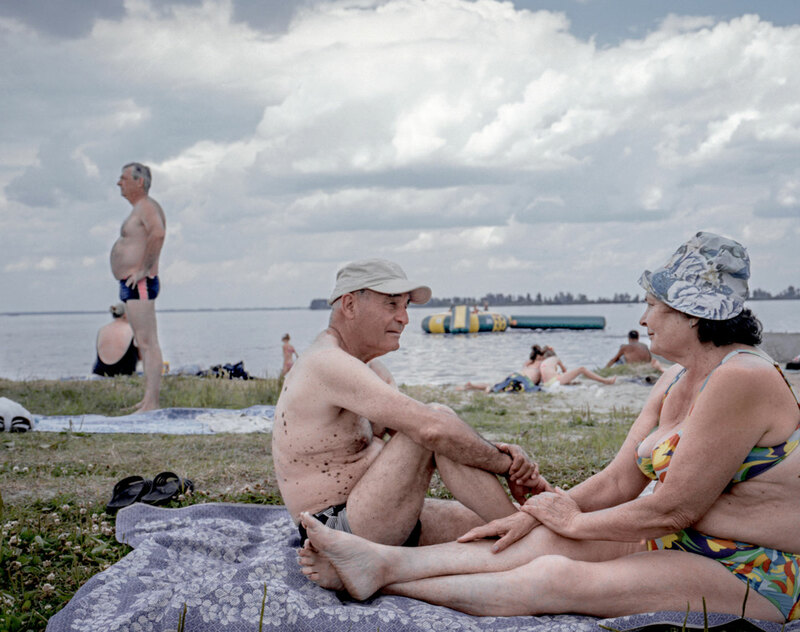 I document how the mixed ethnic and historical legacies of Ukraine brought people into their present realities. In 2014 I completed six trips to Ukraine, talking to people along the river and in those key places inland which shaped the history of today . It was a continuation of the work I did in Crimea in 2008 about a place being neither really pro- Ukrainian nor pro-Russian. While working in various parts of the country, from Kiev to Donetsk and along the river I asked people many questions, including, what it means to be Ukrainian , if the Dnieper River is a border or the main artery of the country and why there is a war in the East. I will revisit people and places I photographed to see how their life’s has changed within a year, beginning with the Maidan revolution and full scale war in Donbas to the shaky cease fire which is now in place. One of the people I plan to revisit is Shura Riazanova . 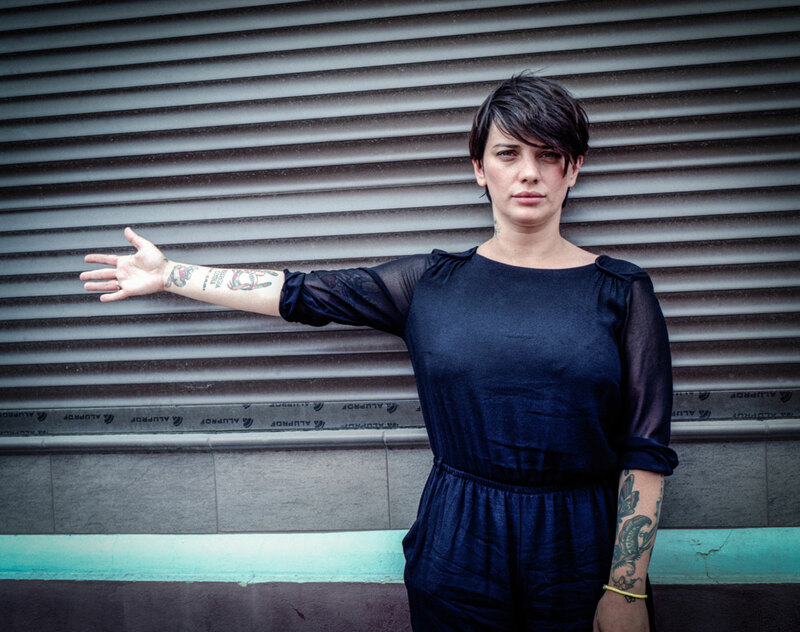 She was a stylist from Crimea living in Kiev, who became a Maidan activist. After Russia took over Crimea, she and her parents became Internally Displaced Persons (IDPs). Now she helps other IDPs and the Army, and considers joining the Volunteer Battalion and fighting, if necessary. Leonid Bibik was also part of the Maidan revolution. He was shot at by the police, but survived. Now, dressed in a costume of ousted president Victor Yanukovich, he poses for photographs with Ukrainians visiting the private residence of the former president, taken over during the protests. That residence now serves as an informal Museum of Corruption.. In my story, the Dnieper River is a symbolic line of reference that serves as a metaphor for the present split in the country. It connects all sides of the story. I have heard local people in Dniepropetrovsk, an industrial city on the river, calling it the “ new war capitol of Ukraine.” Making the Dnieper the line of reference for my story allows me to talk about the most important issues in a wider political, historical and geographical context, which is so absent from the stories I see about Ukraine. The river is a major symbol of Ukrainian statehood that unites extensive areas on both its banks. But it also is a source of deep divisions. For the last 300 years the Dnieper’s left and right banks have roughly translated into a general orientation towards Moscow on one side and Europe on the other. Lands on the right bank have commonly been considered the heartland of ethnic Ukrainian territory,while the left bank has identified as Russian. And Kiev and Central Ukraine today are generally pro-West. Today’s eastern and western Ukraine even have different versions of recent Soviet history. The lingua franca of eastern Ukraine is Russian while in the western part of the country it is Ukrainian. However, in public spaces, including TV political talk-shows, people mixed both languages while speaking to each other, as if there was no division at all. My goal is to cover as many perspectives as possible across a country divided between Western and Russian sympathies and connections. 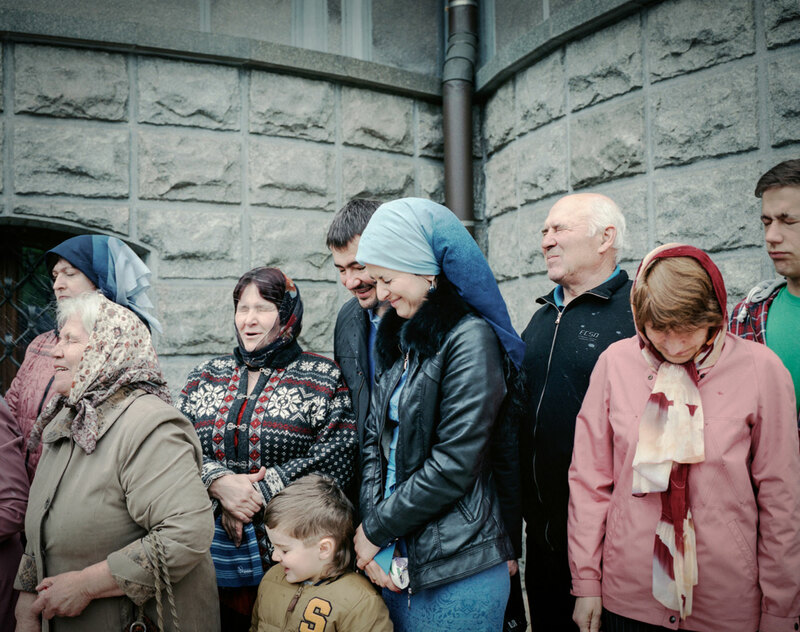 What I see happening inUkraine feels like déjà vu, a story I know well from the twelve years I spent in the Caucasus, documenting its frozen conflicts. I came to understand how that state of affairs affected not only individuals, but the entire society. Being Polish, there is also a very personal element in this story. Poland, and my own family, have had a very troubled history with Ukraine, yet it is Poland which is Ukraine’s strongest supporter today. While relations between Ukraine and Poland serve as an example of a not- easy but nevertheless possible reconciliation, Ukraine’s other neighbor, Russia, practices an opposite strategy, which is to keep people apart by supporting war, divisions and hatred. I strongly believe that what Ukraine needs now more than anything is reconciliation among its own citizens. The country’s internal split was deepened by the armed conflict in Donbas and it is being fueled by propaganda that creates new historical narratives. With my work I am trying to reconstruct a common narrative where opposing sides can understand each other’s motivations. Photography is an excellent tool to discuss complicated and painful topics in societies which have been affected by political turmoil. It is a non-aggressive medium, which does not create definitive statements, but rather allows people to start open discussions and listen and look at each other without pre-conceptions. Ultimately, I would like to exhibit my work in cities across Ukraine in an effort to create a common platform of understanding. My work will hopefully provide residents of different regions an opportunity to see themselves in the context of belonging to one shared country they share rather than one that is split by local differences. Despite the war and its aftermath, Ukraine was never more united as a nation and there is still a huge space left for dialogue and forgiveness. There were many stories done about the war in Donbas but not many long-term documentary stories done about the entire country. First, the Maidan Revolution in Kiev, then Crimea and the war there, dominated the narrative in the news. Now, Ukraine has faded away from the news all together – at a time when fundamental changes are taking shape within Ukrainian society and the geopolitical map of the whole post-Soviet space is being redrawn. I am a self-taught freelance photographer based in Tbilisi, Georgia for the last 10 years. Between 2001-2009 I worked on a project about the South Caucasus and its conflicts, titled, "Shared Sorrows-Divided Lines". Since 2010, I have started to explore a new topic dedicated to women, sexuality and gender issues in the former Soviet space.I began my career in 1999 in Poland, where I’m from, reporting for the daily newspaper, Gazeta Wyborcza. A year later, I started freelancing because it’s important for me to be able to choose my own stories and to tell them the way I think is best. I go on assignments to shoot news stories, but I equally focus my energy on personal documentary work , and if needed self-assign the stories I personaly care for.